In a recent post we established that “ki” was not magic but only natural. Q: But what manifests this natural state of things where no preconceived idea can exist? A: The natural flow and interaction of inyo (yinyang). “the only thing that will never change is that everything is changing permanently”. In this sentence lies the truth about the ki, inyo, life, death (i.e. a fight); everything can be reduced to this equilibrium between in and yo. The inyo concept is based on the eastern understanding of eki 易 i.e. change. In modern Japanese the word “eki” is used for “divination” (or “easy” when pronounced yasashii). When we study the kanji, eki we discover that it is made of two kanji: the sun 日 on top; and the old writing for rain 勿 under (today this kanji is used for “be not, must not”). The original meaning was then “weather change” from rain to sun to rain and the only thing to do was to watch those changes and to adapt to them. This is the same in the dôjô. The opponent’s actions are to be watched carefully and “naturally” answered by going with the flow of the inyo interactions. And this is why we should never separate in and yo as it would create a duality; as it is from this duality that things get confused. Unity with uke is the path to the natural flow. To define this permanent change in the flow of life, the chinese took two old kanji and showing this alternate state in all things. 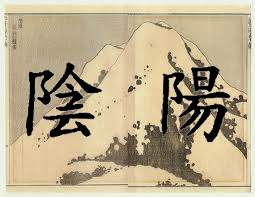 Those two kanji are one in two (in cannot be separated from yo), historically this ishow the Chinese called the two sides of the mountain. The north-facing side, dark and humid (in) and the south-facing side, bright and sunny (yo). You cannot separate them, this is the same with inyo. Yo 陽 is composed of eki (sun and rain) but separated by a horizontal line (check by yourself). This extra line emphasizes the idea of differentiation compared to a natural change as in eki. It defines a moment in the flow where change will occur, where rain will let the sun shining. This is the end of the rain, an instant of change, a kokû 虚空. A space between two moments. The right part (after the “B” shape kanji) of in 陰 is composed of gathering, accumulation 亼 and cloud 云 it gives the idea of an accumulation of tension like before the rain comes. Here also we have a kokû, another space between two moments. Change is everywhere and in the encounter only the one who is able to adapt to the permanent switch happening in the instant is able to manifest the ki and use it within the flow of things. Inyo are (is?) the manifested components of this flow of permanent change that we call the ki. Eki is the essence of the ki and our movements should use this energy to move naturally. In a way we can say that with the use of change eki 易 offered by inyo, we gather 会 the ki 気 so that our actions become easy 易(yasashii). So Arnaud – If I get you right, we are now no longer the Knights who say Ni… ? Actually, in my original text there was a sentence referring to the Holy Grail: “we have become the knights who say eki eki ta (多 multi-) pan (パン, bread)”, but it was difficult to insert it in the text and I thought I would stick to being serious.